Ansonia Clock Co. crystal regulator, "Crown", ca 1914. 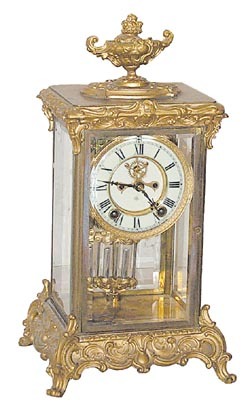 The top urn and urn base are normally seen only on the "Coronet" crystal regulator. I am guessing that the case was missing the urn, and Bubba put the only one he had on this case, tightened it too much, cracking the base under the urn. This can all be corrected. Get a new urn from Timesavers and make the "Crown" correct. The brass doors are tarnished, 1 side glass is cracked in one corner. Case needs to be completely cleaned and polished. 8 day, half hour cathedral gong strike, it is running. 2 piece porcelain dial has faint hairlines at the time winding arbor. 2 jar imitation mercury pendulum, and an original Ansonia signed key. Ly-Ansonia, No.357 Crown, No.351 Coronet.